Abstract: In her September column, Kerry Hennigan discusses how each of us can celebrate Michael Jackson at home. She encourages fans to ‘do their own thing’. Hennigan, Kerry. 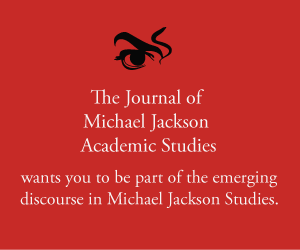 “MJ Studies Today XXI (14-09-2017).” The Journal of Michael Jackson Academic Studies 4, no. 4 (2017). http://michaeljacksonstudies.org/mj-studies-today-xxi/. Every year Michael Jackson fans come together to celebrate his birthday. There are online parties, special fundraising activities and lots of dancing and singing along to Michael’s music and viewing of his short films – often with a birthday cake in close proximity. Some fans make the journey to Las Vegas for the official celebrations at Mandalay Bay’s MJ ONE theatre. Others visit or send flowers to Forest Lawn to adorn Michael’s tomb. Not all fans are conveniently located to partake in these types of events. I’m someone who usually celebrates Michael’s birthday at home in Australia, so I’ve had to devise special activities to mark the occasion. I’ve been fortunate in my employment to have been permitted to throw an office morning tea party for Michael’s birthday each year since his passing. We have flowers, decorations, photos and cardboard cutouts of him (all of which I provide) plus food, drink and music. It has been a blessing that my fellow workers – from juniors to senior executives – join in on these occasions. This is my contribution to building a positive culture in our workplace – at least that’s the excuse I give when seeking approval for taking up some office time and space for my event. In reality, what is important is the opportunity the party provides to share my love of Michael in the hope of fostering greater appreciation of him. Not everyone has such an accommodating employer; not everyone works or has someone with whom to share the celebrations. That’s why I like to encourage other fans to ‘do their own thing’ depending on their personal circumstances. It can still be special, and they can take photos to share on social media – even if they just depict a favourite picture of Michael placed on a shelf, flanked by flowers and/or a candle. This year I have planted a dwarf apple tree that I had purchased in June as part of the Michael Jackson Living Legacy Project. I decided to hold off planting the young tree until close to Michael’s birthday, which falls just before the commencement of spring down under. This gave me time to make the necessary preparations – finding a suitable location in our already tree-filled yard, then clearing the underground and digging a large hole which had to be backfilled with compost. All of this was done as an act of love for Michael. Finally, on the weekend immediately preceding Michael’s 59th Birthday, I planted the tree, which I named Applehead – of course! The planting wasn’t the be-all and end-all of the exercise, however. A bit of decorating was required before taking photos, as well as some attention given to the tree’s immediate surroundings to help make this a special part of the garden; literally “a little space, to make a better place”. This creation of a place to honour Michael’s legacy is not uncommon among MJ fandom. I’ve seen people’s in-house displays, shrines, nooks and gardens where they can light candles, play music, meditate or pray, or just retreat to when some tabloid concocts an upsetting headline. Such a space – large or small – can provide peace and solace, a place to connect with the planet, with Michael, or just retreat from the noise of everyday living. This doesn’t mean we are setting Michael Jackson up as an object of veneration – at least not in my view. Like us, he was a fallible human being; and there would have been times when he felt the need for a place away from the spotlights to commune with nature, to quiet his mind in meditation and to write songs; as well as the space and security to laugh and play with his children, entertain his friends and host busloads of sick and under-privileged kids at his amusement park. Most of us are unlikely to have a place like Neverland to cater to all these sorts of activities. But we can still create our own special place – a sanctuary – where we keep the flame of his life, legacy and memory burning, and where we can experience our own healing in troubled times.